This tray is thought to be the only Beer Tray produced for Acme Beer prior to Prohibition. It shows a Pony Express rider galloping through a western scene, which was in keeping with other advertising themes used by the company. This tray is very rare and prized by collectors and can be worth thousands if condition is good. 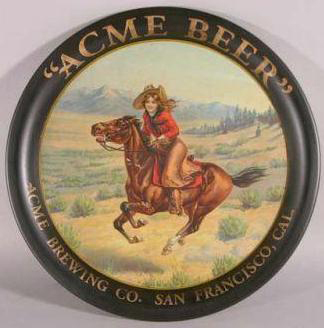 If you have a Pony Express Acme Beer tray please Contact Us for our best offer or to get it appraised.